When I mentioned to a group of church friends this past weekend that I was writing a blog post on cemeteries, with the thought that some parents might want to take their children to these special spots to study history, one of my friends asked, “You’d take a child to a cemetery?” Well, yes, I would-- because when I was growing up, taking wreaths to my father’s parents’ graves on Memorial Day was an important part of family life. And it usually got him talking about his mother, whom I never met because she died in 1940. It was one way I learned about my paternal grandmother’s life. My husband and I both enjoy studying history via headstones. We found this out on our first date. He had officiated at a funeral that day and somehow we got to talking about cemeteries and we ended up at the main cemetery in Fort Collins, CO walking around. We discovered that there had been a smallpox epidemic in the city in the early 1900s, that those who had died of the disease were buried in a far corner of the cemetery, and in 1980 there was still a wide berth around those graves before any others were laid to rest near them. My maternal grandmother always called Memorial Day “Decoration Day”, its original name, because this was a time to honor those who died in service to their country. According to www.usmemorialday.org: “There are many stories as to its actual beginnings, with over two dozen cities and towns laying claim to being the birthplace of Memorial Day. There is also evidence that organized women&apos;s groups in the South were decorating graves before the end of the Civil War: a hymn published in 1867, ‘Kneel Where Our Loves are Sleeping’ by Nella L. Sweet carried the dedication ‘To The Ladies of the South who are Decorating the Graves of the Confederate Dead’ (Source: Duke University&apos;s Historic American Sheet Music, 1850-1920). While Waterloo N.Y. was officially declared the birthplace of Memorial Day by President Lyndon Johnson in May 1966, it&apos;s difficult to prove conclusively the origins of the day. 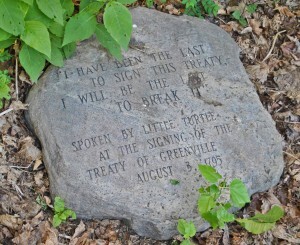 It is more likely that it had many separate beginnings; each of those towns and every planned or spontaneous gathering of people to honor the war dead in the 1860&apos;s tapped into the general human need to honor our dead, each contributed honorably to the growing movement that culminated in Gen. Logan giving his official proclamation in 1868. It is not important who was the very first, what is important is that Memorial Day was established. Memorial Day is not about division. It is about reconciliation; it is about coming together to honor those who gave their all. “Memorial Day was officially proclaimed on 5 May 1868 by General John Logan, national commander of the Grand Army of the Republic, in his General Order No. 11, and was first observed on 30 May 1868, when flowers were placed on the graves of Union and Confederate soldiers at Arlington National Cemetery. The first state to officially recognize the holiday was New York in 1873. By 1890 it was recognized by all of the northern states. The South refused to acknowledge the day, honoring their dead on separate days until after World War I (when the holiday changed from honoring just those who died fighting in the Civil War to honoring Americans who died fighting in any war). It is now celebrated in almost every State on the last Monday in May (passed by Congress with the National Holiday Act of 1971 (P.L. 90 - 363) to ensure a three day weekend for Federal holidays), though several southern states have an additional separate day for honoring the Confederate war dead: January 19 in Texas, April 26 in Alabama, Florida, Georgia, and Mississippi; May 10 in South Carolina; and June 3 (Jefferson Davis&apos; birthday) in Louisiana and Tennessee.” Now, if you don’t plan to put wreaths on graves this year, you’re not alone because Memorial Day has drastically changed in focus from what it once was. But that doesn’t mean that at some point this summer or fall you can’t take in a few of the cemeteries around here and see an interesting look at the past. There is a small cemetery—Oak Cemetery-- just off South Bend and Jefferson, behind the Subway/DQ and the strip mall, that has been around a long time. You can find more information about this cemetery and the people buried there at http://www.rootsweb.ancestry.com/~inallcem/aboite/bullard.html. 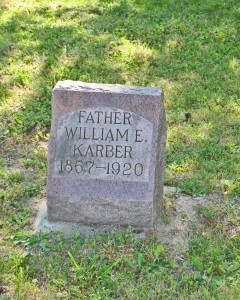 Father William Karber, whose headstone is pictured here, has one of the older headstones that have remained in good condition. 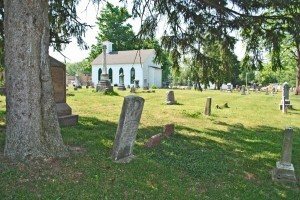 Further south, along Engle Road, is St. John’s Lutheran Cemetery, established in 1853, but not at this location. When this Evangelical Lutheran Church was established by German Lutheran immigrants, they also felt it important to establish both a school and a cemetery. Their first five acre cemetery was adjacent to the Fort Wayne City Cemetery at the location of what is now McCollough Park on Broadway near the GE Plant. Around 1864, the city moved their cemetery to its current location on West Main and it was renamed Lindenwood. St. John’s moved their cemetery also to Maple and Park Avenue. But neighbors at the original spot and the newer one were “uncomfortable” with having a cemetery in their neighborhood and so the third cemetery for St. John’s was dedicated in August, 1872 on Engle Road. With every move, all of those buried in the cemeteries were also moved. According to the web site http://www.stjohnluth.com/wordpress/wp-content/uploads/2012/03/Cemetery-Brochure.pdf, of the original “Founding Fathers”, only Michael Mueller is not buried at this cemetery. The headstones in the St. John’s cemetery reflect the German heritage of those buried there. A number of graves have stones carved with German words. And the artwork of the monuments is spectacular. If you go further into Waynedale, down Old Trail Road, you will come to Prairie Grove Cemetery, established in June 1874. Burials at this site, donated by Joseph and Catherine Mason, actually occurred as early as 1834. The chapel on the ground was built by the United Brethren Church in the 1850s and was served by circuit riders until 1901. 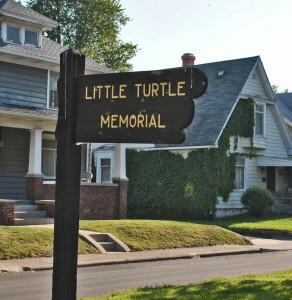 Have you ever been to the Little Turtle Memorial on Lawton Park Place? Signs direct you to the site from Spy Run and once you’re parked you venture back between two houses to a small wooded area. Tucked into the space are various stones with carvings about one of our area’s more famous Native Americans. There are a number of large cemeteries in Fort Wayne but the most “famous” is undoubtedly Lindenwood. Many of Fort Wayne’s founders are buried here and we have a couple of good pamphlets in our gift shop to guide you on a walk through this beautiful place in the heart of our city. “Eternal Landscapes: A Historical and Natural Guide to Lindenwood Cemetery” provides a map of different kinds of trees and birds you’ll find there and “Pioneers Resting in Historic Lindenwood” gives a brief guide to some of our town fathers and mothers and their contributions to our city. History is more than dates, wars and presidents. It’s people. And with the resources we have in this city to study the people of the past, it’s a shame not to take advantage of them. 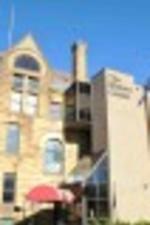 Take some time this year to get to know your city and come visit the History Center. You’ll be glad you did.